Keep your home fresh and happy with the Litter Genie Plus Cat Litter Disposal System. 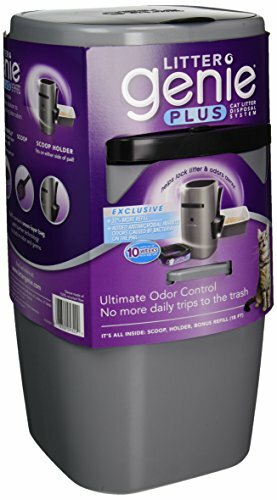 This complete and hygienic soiled litter disposal solution is easy to use and effectively seals in odor for a more pleasant home environment. The Litter Genie Plus Cat Litter Disposal System reduces odor, makes clean-up quick and easy, hygienically seals soiled litter clumps and reduces trips to the garbage. With built-in antimicrobial protection the Litter Genie Plus is the ultimate hassle-free solution to controlling litter odors. Compact design makes it great for small spaces and the easy-carry handle makes it convenient for homes with multiple litter box locations. If you have any questions about this product by Litter Genie, contact us by completing and submitting the form below. If you are looking for a specif part number, please include it with your message.